Pan teaching the shepherd Daphnis, to play the panpipes. Roman copy of Greek original attributed to Heliodorus. Found in Pompeii. Pan (Greek Πάν, genitive Πανός) is the Greek god of nature who watches over shepherds and their flocks. He is most commonly depicted as having the hindquarters, legs, and horns of a goat, with the upper body and hands of a human male, resembling a faun. He often holds either a shepherd's crook, used for hunting small game, or else a syrinx, a flute-like instrument also known as the panpipe. Pan was considered to be the god responsible for the adjudication of human activities involving animals, most prominently hunting and animal husbandry. He was also characterized by a close symbolic link to the undomesticated world. In the poetry of the fifth century, Pan and the natural habitat in which he was said to live became a metaphor for the pastoral as it exists in contrast to the urban. Pan's dual nature as both divine and animal plays upon the tenuous balanced between disorder and harmony, the primal and the cultivated. Pan also was thought to inspire panic, the paranoid fear that has the potential to reduce human beings to their most animalistic instincts, particularly when they are in lonely places. It is from the name Pan that this word derived. Thus, the story of Pan's birth in which his appearance causes his mother to flee in terror serves as something of an origin myth for this variation of fear. In the Battle of Marathon (490 B.C.E. ), it is said that Pan inspired panic in the hearts of the Persians, allowing the Athenians, whom he favored, to gain the upper hand. Pan was also considered responsible for causing individual, possession-like disruptions of the psyche, or panolepsy. In addition, Pan was later known for his music, which was capable of arousing inspiration, sexuality, or even panic itself, depending upon the god's intentions. 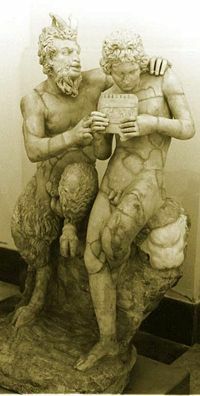 Pan was most commonly worshipped in Arcadia, although a number of cults were dedicated to him in Athens and other major Greek centers by the fifth century B.C.E. The Roman counterpart to Pan is Faunus, another nature spirit. The theonym pan is of Indo-European derivation, following from the word pa-on, which means "herdsman" and shares its prefix with the Latin pastor and the modern English word "pasture." The name is often mistakenly thought to be identical to the Greek word pan, meaning "all." This misunderstanding probably originated out of the Homeric Hymn to Pan, in which Pan is described as having delighted all the gods. This dual-usage of the word pan was subject to some Platonic wordplay: in Plato's work Cratylus, the god Pan is portrayed as the personification of the entire cosmos, embodying both the lower animal nature as well as the higher spiritual nature of humanity. Pan may have at one point been multiplied as the Panes, as is suggested in myths which tell of Pan boasting that he had slept with every maenad for the purpose of creating a whole brotherhood of creatures like himself, also known as the Paniskoi. In support of this theory, depictions of the retinue of Dionysus, as well as those of wild landscapes in ancient Greece, often picture not only a great Pan, but also little Pans, who played a role similar to that of the Satyrs. Kerenyi notes that in Rhesus, Aeschylus distinguished between two Pans, one who was the son of Zeus and twin of Arkas, and another who was a son of Cronos. Pan was first worshiped in ancient Arcadia, a mountainous area in central Peloponnessus. The majority of Greeks disdained Arcadia and its inhabitants, as the society was far removed from Classical Greece, with a pastoral economy and rudimentary political system. Furthermore, the mountain dwelling Arcadians themselves were considered somewhat backwards and primitive. Thus, the fact that they held a figure of the wilderness in such high regard is not surprising. The parentage of Pan is unclear. He is most commonly considered to be the son of Hermes and a nymph, either Dryopeor Penelope). The Homeric Hymn to Pan claims that, upon seeing his goat-like appearance, Pan's mother ran away in fright. He has been variously considered a son of Zeus, Apollo, Cronus, Uranus, Odysseseus, Antinoos, or Amphinomos. Despite suggestions that Pan was the son of an Olympian god, he often appears in some myths to be older than the Olympians. For instance, this is implied in the story which explains that it was Pan who gave Artemis her hunting dogs. Myths involving Pan frequently contain music. One of the famous myths of Pan describes the origin of his trademark pan flute. It begins with Pan experiencing immense feelings of love for Syrinx, a beautiful nymph who, as a follower of Artemis, maintained a strict vow of chastity. Though she scorned them all, Syrinx was nonetheless beloved by the satyrs and other wood dwellers. As she was returning from the hunt one day, Pan ambushed her. She ran away without pausing to hear his flattery, and he pursued her from Mount Lycaeum until she came upon the bank of the River Ladon. Here he overtook her. Desperate, Syrinx called upon the river nymphs for help, and just as Pan laid hands on her, she was transformed into the river reeds. When the air blew through the reeds, it produced a plaintive melody. Pan took these reeds to fashion an instrument that he dubbed the syrinx in honor of his lost love. On another occasion, Pan had the audacity to compare his music with that of Apollo, the sun god who was a formidable player of the lyre. He then proceeded to challenge Apollo to a trial of skill. Tmolus, the mountain god, was chosen to umpire the competition. Pan blew on his pipes, and with his rustic melody gave great satisfaction to both himself and his faithful follower, Midas, who happened to be present at the time. Then Apollo struck the strings of his lyre. Tmolus at once awarded the victory to Apollo and everyone in attendance save Midas agreed with the judgment. Midas dissented and questioned the merit of the award. Apollo would not tolerate such an insipid listener any longer, and turned Midas' ears into those of a donkey. Another musically-inclined myth involving Pan tells the story of Echo, a nymph who was a great singer and dancer. She also scorned the love of any man. This angered Pan, and he promptly instructed his followers to kill her, which they did, tearing the nymph to pieces which scattered all over the earth. The goddess of the earth, Gaia, received these pieces of Echo, whose voice remained, repeating the last words of others. In some versions, Echo and Pan conceive a daughter before Echo is destroyed: this child has been identified as either Iambe, the goddess of verse, or Inyx, a girl in the form of a bird. Pan is famous for his unfettered sexuality, and is often depicted with an erect phallus. This rampant desire prompted him to do much philandering, plying his charms primarily on maidens and shepherds, such as Daphnis, a Sicilian nymph with whom he consorted, and later taught to play the panpipe. However, Pan was rarely successful in his courting. Just as he was avoided by Syrinx, so too was he abhorred by a nymph named Pitys, whom he stalked untiringly. She escaped his pursuit only when the gods turned her into a pine tree. Though Pan failed with Syrinx and Pitys, he was not so unfortunate with the Maenads, making love to each of them. It is also said that Pan enticed the moon goddess Selene. Pan accomplished this feat by wrapping himself in a sheepskin to hide his hairy black goat form, and drew Selene down from the sky into the forest where he seduced her. Worship of Pan began in Arcadia and remained the principal area of his worship. Pan was considered Lord of Arcadia and guardian of its sanctuaries. One enclosure dedicated to Pan stood on Mount Lycaeus and functioned as a sanctuary for animals that were stalked by the wolf, consistent with the idea that Pan protected all creatures. His ability to bestow sterility or fertility upon domesticated animals gave him particular significance in the worship of Arcadian hunters and shepherds. In fact, Theocritus notes that if Arcadian hunters or shepherds had been disappointed in the chase or with the sterility of their animals, respectively, they would undertake a rite in which the statue of Pan was whipped and scourged in hopes of calling back the god from inactivity. Arcadians believed that Pan was the keeper of the mountainous lands in which he lead his own flocks, and also considered such places to be his sanctuaries. It was not until the fifth century B.C.E. that a cult of Pan began to develop in Athens, shaping the image of the god into that which is most recognizable today. According to Herodotus's account, Pan was declared an official deity in the city after appearing to the messenger Phillippides on an assignment that took him to Arcadia before the battle of Marathon. Pan questioned Phillippides as to why the Athenians had not yet dedicated a cult to him, despite all his benevolence. After the battle, Athenians remembered this epiphany, and consecrated a grotto on the northwest slope of the Acropolis to Pan. In contrast to his consistently exalted position in Arcadia, Pan went on to lose his status as a major god in the major centers of Greece, assuming a marginal position in the pantheon when compared to more prominent deities such as the Olympians. However, Pan's symbolic value was greatly enriched during this period. Rituals involving the god were no longer confined to the pastoral sphere, and his myth and iconography began to spread throughout other major Greek centers such as Attica, Boeotia, and Delphi. If one were to believe the Greek historian Plutarch in The Obsolescence of Oracles, Pan is the only Greek god who is dead. During the reign of Tiberius (14 C.E.–37 C.E. ), the news of Pan's death came to Thamus, a sailor on his way to Italy by way of the island of Paxi. A divine voice hailed him across the salt water, saying "Thamus, are you there? When you reach Palodes, take care to proclaim that the great god Pan is dead." Thamus did just this, and the news was greeted from shore with much lamentation. The death of Pan upset Tiberius to such an extent that he called together a committee of philologists to find out who exactly the god was. Third century bishop Eusebius of Caesarea interpreted the so-called "death of Pan" to mean that along with the death and resurrection of Christ (which fittingly occurred during the reign of Tiberius), all demons of polytheism had finally died. With such a line of thought in mind, it is likely that the demonized images of the incubus and even the horns and cloven hooves of Satan, which became common in much Christian literature and art in the middle ages, were extrapolated from images of the highly sexual Pan. Despite the declaration of his death, however, Pan is widely worshiped by Neopagans and Wiccans today, where he is known more generally as the Horned God, a male deity of status comparable to the exalted Mother Goddess, who serves as an archetype of male virility and sexuality. 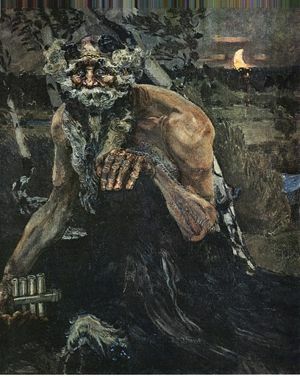 Pan also lives on today in the sphere of literature, where he has continually proved to be a captivating character, appearing in numerous modern works. For instance, he serves as the primary, metaphorical theme in Tom Robbins's Jitterbug Perfume, Knut Hamsun's Pan, and in Shepherds of Pan on the Big Sur-Monterey Coast by Elayne Wareing Fitzpatrick. Famed occultist Aleister Crowley alluded to the god in his Hymn To Pan. Pan also appears in various supernatural fictions such as Arthur Machen's The Great God Pan, as well as Donna Jo Napoli's young adult novel of the same title. Pan appears in the short stories of a number of popular authors, including Stephen King's "The Lawnmower Man" and Agatha Christie's "The Call of Wings." Additionally, the faun in the 2006 Academy Award nominated feature film Pan's Labyrinth seems to have been inspired by Pan, since the movie itself is named after him. ↑ Walter Burkert, Greek Religion (Oxford: Blackwell, 1985, ISBN 0631112413). ↑ Karl Kerenyi, The Gods of the Greeks (London: Thames and Hudson, 1951, ISBN 0500270481). ↑ Catherine B. Avery (ed. ), The New Century Handbook of Greek Mythology and Legend (New York: Appleton Century-Crofts, 1972, ISBN 0390669466). ↑ 4.0 4.1 H. J. Rose, A Handbook of Greek Mythology (London: Methuen & Co., 1933, ISBN 0415046017). ↑ Stanley Lombardo and Diane Rayor, Callimachus: Hymns, Epigrams, Select Fragments (Baltimore, MD: Johns Hopkins University, 1988, ISBN 0801832810). ↑ 6.0 6.1 6.2 Philippe Borgeaud, "Pan," Encyclopedia of Religion (New York: MacMillan Publishing. 1987, ISBN 0029098505). ↑ Ohio State University, Where or what was Palodes? Retrieved June 18, 2007. This page was last modified on 11 January 2019, at 19:51.